Got up this morning (Oct 16/17th) at 04.30 BST and had a great pre dawn comet hunt for 1.5 hours then I waited for LONEOS to rise. I caught it as it cleared the neighbours roof at 06.40 BST in a very intense bright blue twilight sky to the north of Arcturus. It was so low and close to the Sun here that I suspect this will either be my last or second last morning observation of the comet. The sky was so bright that the outer coma was gone leaving only a highly condensed coma only 1.5' in dia at D.C: 8 with a stellar false nucleus and narrow spine. I seen several radial features within the coma. The blue ion tail was very straight and pointing NE for 1 degree and seemed to fan out with distance away from the coma. I am amazed how well that coma and tail are holding up against such a bright sky which reminded me of C/2002 V1 NEAT. 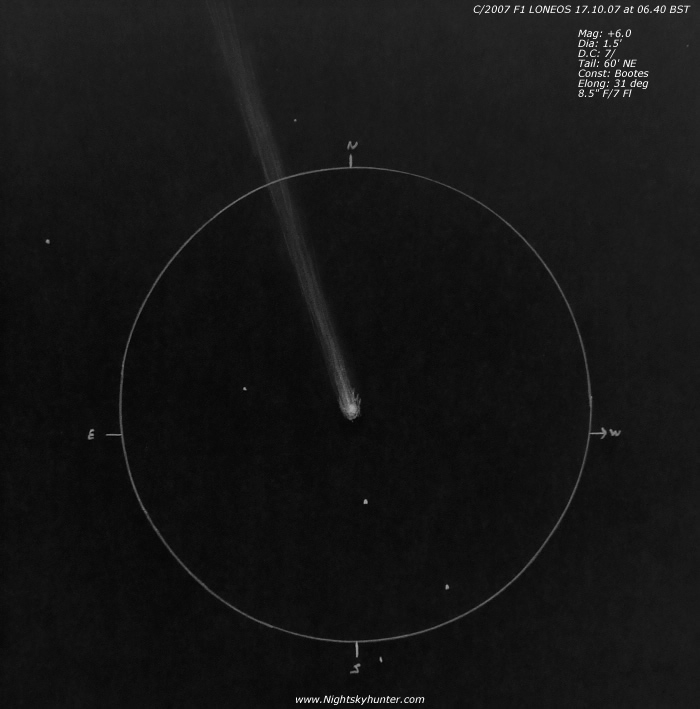 It would be interesting to see how long this comet could be followed. Session ended at 07.00 BST. Mag: + 6.0 Dia: 1.5' D.C: 7/. Elongation: 30 deg.